Cast your fishing line further than you ever dreamed possible with a Paul's Casting Kite. 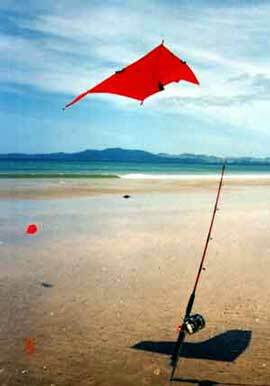 Paul's Fishing Kites manufactures a variety of small delta (Flexiwing Kite) and Pocket Sled Kites. These kites are designed for casting or setting from 3 to 10 hooks as far out from the shore as you wish using any fishing rod and fishing reel combination. These kites can also be flown from a Paul's Fishing Kites Beach Reel. The Pocket Sled Kites operate from any fishing rod and fishing reel spooled with 8 to 15 kg line weights. 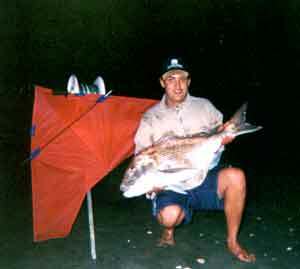 The Flexiwing Kite however can be run from either a large capacity boat fishing reel such as a Penn Senator or Daiwa 6/0 or bigger spooled with 20 to 30kg line, or can be used from a Paul's Fishing Kites beach reel. Both the Flexiwing and the Pocket Sled Kites are a load of fun and are very productive. 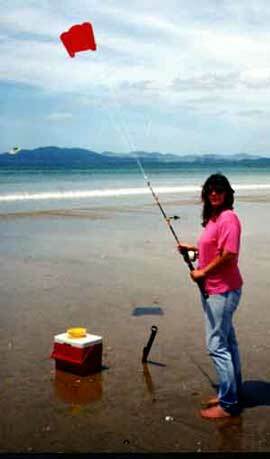 Fishing rigs using the Pocket Sled Kites or Flexiwing Kites are easily managed by one person. They are compact and highly portable so you could have one in the car ready to go at all times. While the Pocket Sled Kites are a great introduction to kite fishing, they are not a tackable kite and require the winds to be 45 degrees or more offshore. On the other hand, rigs built around the Flexiwing Kites are fully capable of tacking up to 60 degrees off the wind and of performing as well as, or better than, some of the bigger Dropper Rigs. The Flexiwing Kite has a huge wind range and can fly in lighter and stronger winds than either the Large or Small Pocket Sled Kites. Our range of Casting Kites will assist you to cast your line offshore to the full distance of the line on your reel! Paul's personal favourite, the Flexiwing Kite run from a Penn Senator 9/0 reel on a short stout rod. The perfect kite for either a large capacity boat reel (e.g. Penn Senator 6/0 or 9/0 range) or from a Paul's Fishing Kites Beach Reel. This unique small delta kite is manufactured from the highest quality materials and is fast becoming New Zealands most popular fishing kite by demand. The complete carbon fibre frame of the Flexiwing Kite results in the lightest most rigid kite possible. This kite is manageable throughout a phenomenal wind range due to rubber bands fitted to each end of the cross spar. These rubber bands allow the kite to decrease in wing span as the wind increases in order to spill excess wind in extreme gusts. An ideal kite for those who enjoy fishing solo. The Flexiwing Kite is best suited to line weights of 20 to 30 kg and will easily tow 5 to 10 hooks up to 1000 metres offshore. These small sparless kites are specifically designed for small capacity boat reels or surfcasters spooled with 8 to 15 kg line weights while towing 2 to 5 hooks offshore as far as your reel capacity allows. Designed for downwind flight, these kites require the wind to be 45 degrees or more offshore. A fun and effective way to try out kite fishing! 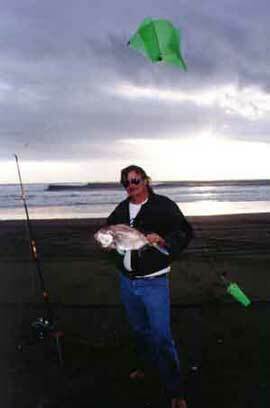 Easily fish 500 metres or more offshore. Greatly increase your casting distance with a Large Pocket Sled. If you are fishing predominantly moderate to strong wind areas then the Small Pocket Sled Kite is ideal. These small sled kites are ideal on lighter lines such as 8 or 10 kg and will tow out up to 3 hooks per set as far offshore as your line capacity allows. Maximise your fishing opportunities over a wider wind range. Both the Large and Small Pocket Sled Kites can be flown from the same line in order to support your mainline clear of the water for further distance offshore. Or you can use the Large Pocket Sled Kite for the light to moderate winds and the Small Pocket Sled Kite for moderate to strong winds. Cover a wider wind range and increase your fishing opportunities with the Two Kite Pocket Sled Pack for the ultimate cast in any offshore wind. Paul's Fishing Kites has a complete range of spare parts for all of their Fishing Kites.